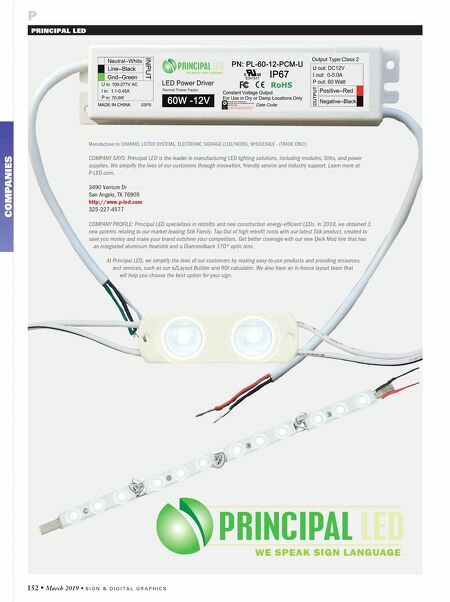 152 • March 2019 • S I G N & D I G I T A L G R A P H I C S COMPANIES P PRINCIPAL LED Manufacturer in CHANNEL LETTER SYSTEMS, ELECTRONIC SIGNAGE (LED/NEON), WHOLESALE - (TRADE ONLY) COMPANY SAYS: Principal LED is the leader in manufacturing LED lighting solutions, including modules, Stiks, and power supplies. We simplify the lives of our customers through innovation, friendly service and industry support. Learn more at P-LED.com. 3490 Venture Dr San Angelo, TX 76905 http://www.p-led.com 325-227-4577 COMPANY PROFILE: Principal LED specializes in retrofits and new construction energy-efficient LEDs. In 2018, we obtained 3 new patents relating to our market-leading Stik Family. Tap Out of high retrofit costs with our latest Stik product, created to save you money and make your brand outshine your competitors. Get better coverage with our new Qwik Mod line that has an integrated aluminum heatsink and a Diamondback 170º optic lens. 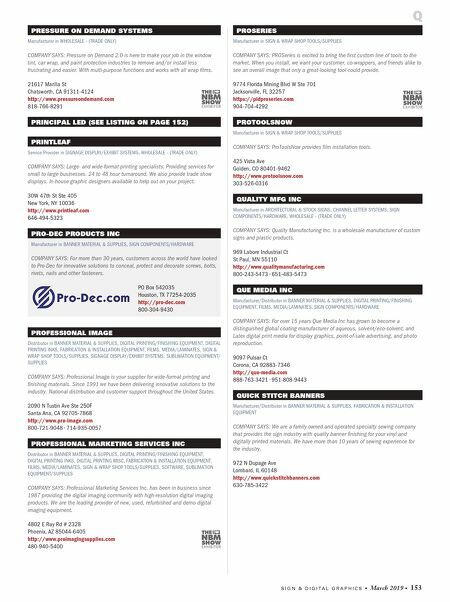 At Principal LED, we simplify the lives of our customers by making easy-to-use products and providing resources and services, such as our eZLayout Builder and ROI calculator. We also have an in-house layout team that will help you choose the best option for your sign.